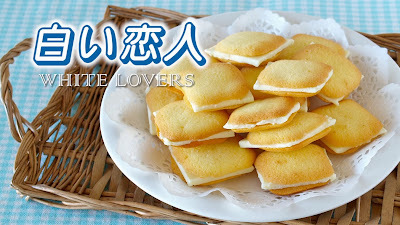 Shiroi Koibito (白い恋人), literally means "White Lovers", also called Chocolat Blanc et Langue de Chat, is the best and well-known souvenir sweet from Hokkaido which consists of two thin butter cookies and a layer of white chocolate in between. 1. Draw about an inch and a half squares (leaving about an inch between) on a piece of paper. 2. Melt butter in a microwave (in a microwavable dish) and cream it in a bowl. Add granulated sugar, egg, and cake flour (sift), in order and mix well. *Yes, you can add vanilla extract to taste. 3. Preheat the oven to 180C (356F). 4. Transfer the batter to a pastry bag and snip off the end. Line a baking sheet with parchment paper, place the template under the parchment paper. Pipe out the batter in the squares (the batter will spread a little, so keep it smaller). Then remove the template. *You can bake 60 thin cookies. 5. Bake at 180C (356F) for 8-10 minutes. Let the cookies cool completely on the baking sheet. 6. Melt 120g (4.2oz.) white chocolate over a double boiler, line 6-inch square pan with plastic wrap (or use aluminium foil! I heard it is much easier and you may not need a square pan), then pour in the chocolate and spread evenly. Place it in the freezer to harden up a little bit. Cut it into 16 squares. *You can make 16 thin chocolates using a 6-inch square pan, so repeat the step to make 32 chocolates. 7. While the chocolate is soft, place it between two cookies. Place the cookies in the freezer to harden up completely. You'd better keep the cookies in the fridge in summer. You can store at the room temperature in winter, of course. FYI: This online shop says "OK! overseas shipping" but I am not sure… sorry.